Lichens are fungi that form symbiotic associations with photosynthetic green algal or cyanobacterial cells, from which they obtain food. Approximately 20,000 species are recognized, most of which are ascolichens (the fungus is a member of the Ascomycota); less than 1% of named lichen fungi are members of the Basidiomycota. Most lichens have green algal (phylum Chorophyta) photosythetic partners and the rest have cyanobacteria alone or in combination with green algae. Lichens are floristic components of most terrestrial ecosystems on every continent, and the dominant vegetation on about 8% of the earth’s surface (Nash, 1996). It is impossible to generalize about lichen ecology since lichens inhabit terrestrial habitats ranging from arctic tundra to tropical rainforests. As ‘plant-like’ fungi, however, all lichens require light, so typical substrates include rocks, bark, leaves and soil, nearly any surface that is exposed to adequate amounts of light. This requirement for light means that lichen fungi are frequently exposed to conditions uncommon for normal fungi. Lichens are especially noteworthy for their tolerance of extreme temperatures and irradiation levels. For example, lichens are one of only a few groups of organisms that colonize substrates in hot and cold deserts, where they may live both on the surface and even inside of rocks as endolithic organisms (Friedmann, 1981, 1982; Green et al., 1999; Wynn-Williams et al., 2000; Galun, 2001; de los Ríos et al., 2005). A recent European Space Agency experiment even demonstrated that certain lichens (Rhizocarpon geographicum and Xanthoria elegans) exhibit no ill effects after a 15-day exposure to open space (Sancho et al., 2007). Despite their tolerance of extreme natural conditions, however, many lichens are sensitive to air pollution, which is why they are frequently used as biomonitors. Lichen floristic patterns change as sensitive species are replaced by tolerant species. Especially sensitive and tolerant species can therefore be used as bioindicators of atmospheric quality. Sensitive species exhibit structural, physiological and behavioral changes including reduced photosynthesis, bleaching and death of the symbiotic algae, and discoloration and reduced growth of the fungus. Tolerant species are known to accumulate pollutant elements from the atmosphere and can thereby sere as "passive monitors" of air pollution. When transplanted to polluted sites, sensitive species exhibit physiological stress and increased mortlity; tolerant species accumulate pollutant elements and can also exhibit measurable changes in physiology and growth rate. NPLichen lists over 29,000 records (over 2,500 species total) of documented occurrences of lichens in 149 park units of the U. S. National Park System. NPElement lists element data (48 elements total) for 75 lichen species surveyed in 43 park units. Lichens have been collected and studied in the Washington, D.C. region since the late 1800's, and numerous collections are available in the U.S. National Herbarium. Studies of lichens as environmental monitors in the region began in 1965 when Mason E. Hale, Jr., curator of lichens at the Smithsonian Institution, initiated long-term growth-rate studies of rock-inhabiting lichens on Plummers Island, Maryland in the Potomac River. Beginning in 1975, James Lawrey of George Mason University joined Hale in these studies and additional study sites were established at Great Falls, Maryland, Rock Creek Park in Washington, D.C., various other locations in the Washington area, and in Shenandoah National Park. In addition to lichen growth rates, Hale and Lawrey began comparative studies of lichen floristic composition and element accumulation. established permanent study sites at various locations in the Washingon, D.C. area. provided long-term information about lichen growth rates and correlations with enrvironmental variables (Hale 1970, Lawrey & Hale 1977, 1979). began to document lichen floristic composition and element concentration at these permanent sites (Lawrey 1991, 1992). provided comparative retrospective data for changes in lichen communities and element content during the past 100 years (Lawrey & Hale 1981, Lawrey 1993). In eastern U.S. nitrophilous, relatively pollution-tolerant lichen communities have developed over time, probably the result of poor air quality in the past and only slight improvement since. A recent study (McCune et al. 1997) analyzed lichen community patterns throughout the southeastern U.S. as a part of the Forest Health Monitoring Program. The authors found two major gradients in the data, one a macroclimatic gradient from the coast to the Appalachian Mountains primarily related to temperature, and the other correlated with air quality. Epiphytic macrolichens were found to be sparse or absent in urban areas. In rural areas, lichen communities are more luxuriant and contain a greater number of pollution-senstive species. A similar, but more complicted, trend was found for the northeastern U.S. The National Atmospheric Deposition Program provides information on pollutant deposition patterns in the United States and the national deposition patterns for sulfate and inorganic nitrogen (2005 data shown below) indicate that the eastern U.S. is subject to generally high deposition of both types of pollutants. This can result in simplification of lichen communities through acidification and eutrophication. Lichens especially tolerant of these changes will tend to dominate communities over time. It is estimated that 60% of the mercury that circulates in the atmosphere globally is of human origin, primarily from industrial, power plant and incinerator emissions. The Tennessee Valley Authority maintains a mercury information page that summarizes sources of mercury in the U.S. A major concern about mercury deposition is that it never breaks down, so it can be recirculated in the environment long after its release. 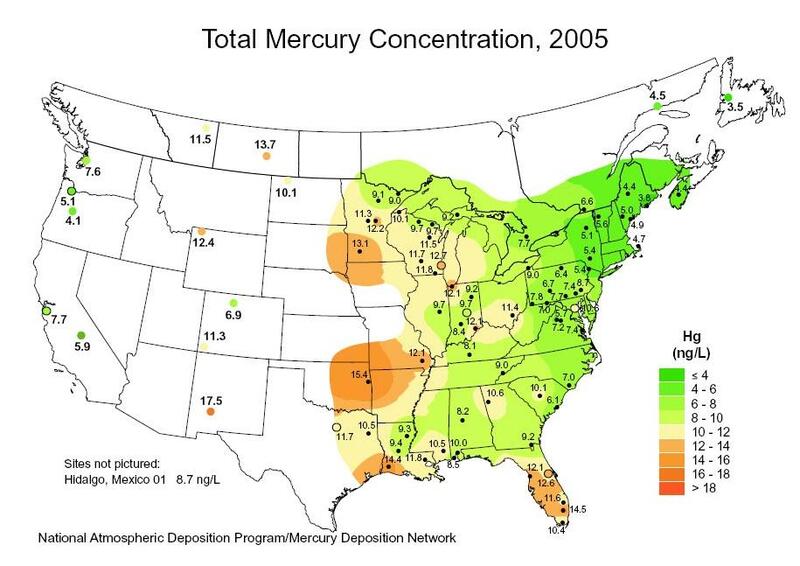 Since mercury is a toxic heavy metal, there are concerns about atmospheric cycling and deposition of mercury, and the potential consequences to human health caused by mercury released into the environment. Human health problems are usually caused by consumption of fish that have bioaccumulated an especially toxic form of mercury, methylmercury, in aquatic ecosystems. However, little is known about the health hazards associated with atmospheric mercury. Lichens have been used to monitor Hg emissions around factories, mines and power plants in a large number of studies (Steinnes and Krog 1977, Makholm and Bennett 1998, Bargagli et al. 1987, Bylinska et al. 1991, Chilton and Orvos 2004, Ikingura and Akagi 2002, Krishna et al. 2003, Lodenius and Laaksovirta 1979, Sensen and Richarson 2002). Lichens have also been used to monitor natural sources of mercury deposition from volcanoes, geysers, and other geothermal sources ( in the U.S. by Bennett and Wetmore 1999, Davies and Notcutt 1996 and in Italy by Bargagli and Barghigiani 1991, Dongarra and Varrica 1998, Grasso et al. 1999, Loppi 1996, Loppi and Bonini 2000). The NADP Mercury Deposition Network provides a database of Hg deposition patterns nationally. Deposition patterns for total Hg are generally low for the eastern U.S. However, Hg bioaccumulation can produce unusually high levels in wildlife. A recent study of songbirds in N.Y. State (reported in NY Times, July 25, 2006) showed high Hg levels, prompting New York to propose more stringent Hg emissions levels for power plants.